COME SEE WHAT YOUR FELLOW SPORTSMAN IS ALL EXCITED ABOUT. YOU TOO CAN HAVE A RANCH CLOSE TO HOUSTON TO ENJOY ON WEEKENDS OR RETIRE ON. 6000 SF Home on 80 Acres -- Over looking your own wildlife sanctuary. Has the most scenic drive with the largest Live Oaks in Colorado County. 80 Acres in Bluebonnet country. Owner financing. 2200 Acres - Native Forest Land - just 45 minutes from Austin in Bastrop County . 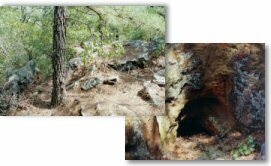 . . commune with nature, solid rock caves, overnight cabin. AAA Ranch - - 870 Acre Scientifically Managed Whitetail Deer Ranch complete with all support facilities. . . including guest house, ranch managers house, barns & stocked bass lake. completely high fenced - lots of contour - GREAT Hunting!